Q: Do you think Grande Prairie residents get proportionate value for their tax dollars? What could be done to improve it? A: No I do not and I haven’t spoken to one constituent that feels our city is representative of the very high taxes we pay. government to brainstorm feasible methods to bring in more revenue. I am excited at the prospect of working with a new council and figuring out the best alternatives to higher taxes. A: I do think residents get value for their tax dollars – having said that there is always room for improvement and I think I’ve shown that it’s possible. Between 2003 and 2010 the average annual property tax increase was 6.6%. In my first term as Mayor my council was able to cut that down to 2.7% and this past term we did even better getting it down to an average of just 2.2%. Of course these are still increases but when we keep in mind that inflation averaged 1.55% over that period and that our community grew by 5.6% each year I think it speaks to how conservative council really has been. With those small increases council has still managed to address crime by adding more resources, open new parks, move forward with re-opening the Bear Creek outdoor pool, invest in downtown and complete major infrastructure programs like the 68th Avenue and 92nd Street twinning while also investing the $34 Million in roads and sidewalks that I mentioned before. I look forward to improving on the results I’ve delivered so far by continuing to invest in the things we need for our growing community while delivering even smaller property tax increases. Part of the solution will be for council to seek out new non-property tax revenue sources. More wfdective & effciwnt use of tax payer dollars are required. It appears that tax dollars are taken for granted as a bottomless pit of funds. A: There is no doubt that property taxes are high in Grande Prairie. The services we get for those dollars are the services one would expect from a city our size. More could be done in some areas, such as transit, however, our tax base is limited. We could have a smaller tax bill and greater revenue if we had more access to industrial and linear property assessment. I am a strong advocate for regional revenue sharing, and partnerships for accessing goods and services. I look forward to working with the County of Grande Prairie on the Municipal Collaboration Framework for exactly these reasons. A: It is hard to tell what value we receive. The City Budget is available, but hard to read for the average person with limited time. We need to do a better job of making it digestible to everyday people. The City of Edmonton and County of Grande Prairie provide excellent examples we could emulate. At the same time, our taxes clearly are high. Council needs to address this. I’ve spent my career working for a non-profit organisation funded by donors. Over the past few years, the economy caused donations to go down. I had to both cut my budget and continue to serve those involved with our programs. I am accustomed to hard budget decisions. I am also used to being accountable with other people’s hard earned resources. A big part of my job is to sit with our funders to give an account of our spending. I look forward to applying this experience to Council. We need to shape a stringent, transparent, and understandable budget. A: I am concerned with the continual increase of taxes and I am concerned that internally our operational costs are still too high. My track record on Council this term shows this. With this said, I truly believe in Grande Prairie and its people. I am business minded and future-focused and believe together, we can build an even better community at an affordable cost. I understand that you can only expect a community to give you as much as you are willing to give it. 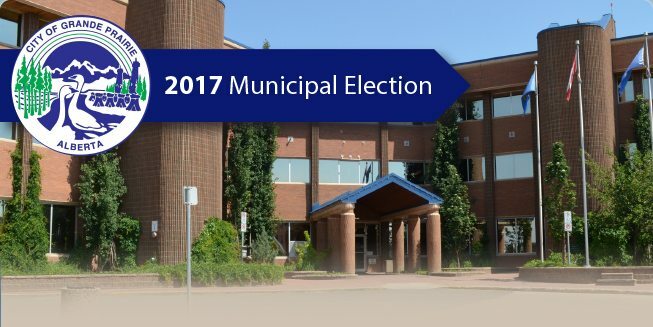 In my opinion, next Council needs to prioritize better public engagement; ensure a strong diverse future for Grande Prairie; identify efficiencies and redundancies to compliment a business-friendly environment, and ensure accountability from all levels of government so the needs of the City of Grande Prairie are addressed. I think we need to provide management with the direction and the vision required to operate more efficiently, while continuing to improve our operational processes within the City. A: yes I believe the citizens get proportionate value but it can be improved by closer valuations of all departments .when it comes to spending there has to be some sense of ownership,not just buy the most expensive because its not their money .There is only one taxpayer! A: Our tax structure needs to be continually reviewed to address whether or not it is meeting the needs of our city, both from a community perspective and a municipal perspective. We have quite the spectrum in our city of those who are wealthy and well-resourced and yet we also have many people in our community on a fixed income, under employed or unable to work. It is essential to ensure the revenue we collect is equitable and responsive to meet the necessities for the broad spectrum of residents we serve. A: No I do not!!! We have lived in the same location for 13 years. The only improvement in that time has been a new sidewalk. Don’t even get me started on the snow removal policy! I believe money has been poorly allocated and unwise spending has been the hallmark of GP city councils for way too long! The best solution would be for some individuals with a more common sense approach to be voted in, so taxpayer money would be used more wisely. A perfect example: downtown “beautification”. Why are we trying to make “northern Alberta” GP look like southern California? All that “wonderful” paving stone work is going to look terrible in a few years thanks to frost heaving and cold weather!! Not to mention the amount of hours required to maintain it!! Just go for a walk along the old sidewalks along 100 Ave….I rest my case!! I saw a post-televised meeting, where a City of GP council member “bragged” about having a massive surplus in the city coffers. If I had been at the meeting, my question to him would have been: “So you are proud of the fact that this council has “stolen” that much money from the taxpayers of GP?” I believe we should be in the business of “making ends meet”, rather than taking excessive amounts of money from the hardworking taxpayers of Grande Prairie!! If the County can reduce/not raise taxes, WHY CAN’T WE?? A: I think our outgoing council has done well in slowing down the tax increases we were facing a decade ago, but we are headed into another growth cycle for our city and I’m concerned about falling back on increasing taxes to meet increased demands on our services and infrastructure. I understand our new city manager has started to implement similar principles in some areas and I’m eager to see the results. I’d love to see widespread improvement measures taken in city departments. A: Feedback from the general public has been no – we have the second highest property taxes in Alberta with an annual average property tax of $3500 and we also have costly utility bills on top of that, making the cost of housing and living in general that much higher. What could be done to improve it? We need to look at every aspect of internal operations and external operations in the sense of contracts for example. We have lost over 1 million square feet of industrial warehouse space to the county. That being said, commercial taxes have been removed from GP yet those corporations are using GP services. We need to touch on the formula that the provincial and federal governments use to provide services and need to look at cost savings initiatives. We need to talk to the municipalities who have their taxes under control and are happy with their tax base to find efficiencies. Also, no more major projects until the recession has passed. A: Yes, but we need to continue to find ways to save or increase revenue to keep our increases at bay. A: The city has grown substantially over the last 10 years putting a lot of pressure on infrastructure. Obviously this comes at a cost, from a financial point of a view your always in a catch up mode. Going forward I would like to see any new and existing city funded facilities be more financially self-sufficient. Its one thing to build a facility but its another to keep it operational. A: Yes, taxes are high in Grande Prairie, please consider also that 18% off the top goes to the selected School Division you support That does put the municipal portion of taxes into a slightly better perspective. I do feel I am receiving reasonably good value for my taxes. We live in a northern city that is hard on infrastructure all year. We have unpredictable weather needs depending on annual snowfall. We live where the population is booming and old infrastructure needs updating and improvements. We have those challenges, yet we live in a City that provides high levels of opportunity for recreation, education, cultural experiences and soon to be health services. These services really that can only be rivalled in centres far larger than Grande Prairie. I think there is certainly room for improvement to try and manage future budget deliberations with some strict internal review of expenses and spending and opportunities for revenue generation with more collaboration of regional partners. A: Unfortunately, Grande Prairie’s revenue per resident is lower than most other comparable cities in Alberta. This is because they all have other sources of revenue. We, in Grande Prairie depend almost entirely on taxes. We need to find other streams of revenue or ways to be more efficient. Whether that is collaborating and working with other organizations who are superior in service delivery or finding alternatives that are not currently offered in our area– there may even be opportunity for “service exchanges” with large companies. Regardless, my guiding belief is that when a Council decides to invest in things that their residents be proud of the money spent. There are a lot of needs this city has that I doubt anyone would argue investing in. Ideally, we will keep taxes as low as they can be but we will need to invest in this city for it to get better. A: Yes I do, would I like to reduce our taxes? Yes I would We have a great airport with two major airlines servicing GP. This council endorsed a process to see how we can reduce internal expenses we can see solutions already. The need to attract industry into the borders is a must in the near future this will reduce the residential tax base by some margin. Remember the city has been growing at a very fast rate for a long period of time there is a cost associated with this. A: People don’t feel they receive good value currently. We must communicate and educate residents on what their tax dollars are being spend on and be honest about the areas that are in need of improvement. City Councillors are Grande Prairie residents too and therefore should continually ask themselves to view each decision as a Councillor and then again as a resident. I strongly believe that there many ways to which we can improve the value for our tax dollars. Ensuring productivity and accountability within City departments would result in substantial tax savings. A: Yes, we pay high taxes but we also have lots of opportunities available to us, more than the average community our size, we also don’t know life to be any other way which makes it hard to compare apples to apples. I think if we can work with the County and surrounding MD’s we can alleviate a lot of additional duplication of services that will impact taxes. We also need to be creative in our strategies, look at what other municipalities are doing regarding revenue and compare that to what we are doing and determine possible enhancements. A: No I think we actually don’t get much for our tax dollars we can always improve efficiency in the city and opening new revenue streams for the city wouldn’t hurt. more working for our families 24 hours a day, 7 days a week. Now, if I were a pack a day smoker, it would cost me $15/day to keep the habit over 365 days, which would be $5475/year and no service at all. For a daily value comparison, lets take our family to a movie (2 Adults + 2 Children). After tickets and snacks, we have paid more than $80 to watch the newest Disney movie for less than 2 hours of our day. So perhaps she has something here. Don’t get me wrong, I am NOT advocating for more taxes, but the question was on proportionate value, so I compared them with a few relatable examples. In total, municipalities across the country collect 7 cents out of every dollar of tax collected by all levels of government and we manage to do a lot for our people with that small amount. We can always do better in providing value for services, and believe me that Councils and Administration are continuously working on improving this year over year. A: We have a lot of great services in Grande Prairie and are very fortunate to live where we do. We need to properly watch what we are spending our money on, encourage the citizens of Grande Prairie (especially the young citizens) to get involved in decision making, and communicate properly with the citizens what we are paying for and getting in return.